We all have neighbors – whether right next door or across the township. Having neighbors is generally a good thing as most times neighbors help each other in need – whether it is loading hogs or combining corn. UMASH, the Great Plains Center for Agricultural Health (University of Iowa) and the Central States Center for Agricultural Safety and Health (University of Nebraska Medical Center) joined their efforts to bring attention to health and safety issues facing the farming community. 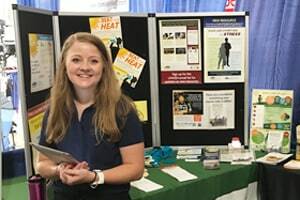 Megan Schossow and Carol Peterson worked in tandem to share information on sun safety, heat illness as well as signs and symptoms of stress in farmers. They were joined by Ellen Duysen and Marsha Cheyney who provided information on respiratory/hearing safety and roadway safety respectively. By working together we are able to reach more people with more information on the key safety issues facing farmers, farm families and workers. Our centers find that keeping farmers safe is a good and neighborly thing to do.